After several delays, Blue Origin launched its eighth successful New Shepard suborbital rocket with “passenger payloads” aboard. This flight was the second for this particular booster and capsule. Blue Origin continues its deliberate series of test flights, earning their second New Shepard vehicle another turtle emblem on its side. Today’s flight experienced a few delays due to thunderstorms and other unspecified checks during the countdown. The original launch window opened at 8:30 a.m. CDT (9:30 a.m. EDT / 13:30 GMT). However, after several postponements, the launch appeared to be a “go” at midday. Following several shorter holds, the countdown was recycled from minus one minute, 55 seconds to minus seven minutes and then restarted without interruption to lift off at 12:06 p.m. CDT (1:06 p.m. EDT / 17:06 GMT). The single BE-3 engine lifted the vehicle off the pad at seven seconds after engine ignition and up to maximum dynamic pressure (Max Q) in less than a minute. Main engine cutoff occurred at approximately two minutes, 24 seconds into the flight at an altitude of about 188,000 feet (35 miles or 57 kilometers) and a speed of about 2,147 mph (3,455 kph). The capsule separated two minutes, 46 seconds into the flight, with the booster returning to the dusty West Texas plains, tail first, two miles from the launch site at a mission elapsed time of seven minutes, 35 seconds. The capsule, putting its payloads and “Mannequin Skywalker” test dummy through their period of zero gravity, returned using drogue and main parachutes. The main chutes bring the capsule down to a descent speed of less than 20 mph (32 kph). The retrothrusters, ignited just before touchdown, ensuring that the capsule touched down at a reasonably gentle 1-2 mph (1.6-3.2 kph) at a mission elapsed time of 10 minutes, 10 seconds. This flight took the capsule higher than it has ever been before. The live feed reported an apogee of some 347,485 feet (65.8 miles or 105.9 kilometers), which is beyond the von Karman Line—62 miles or 100 kilometers’ altitude—the internationally recognized “border” of space. 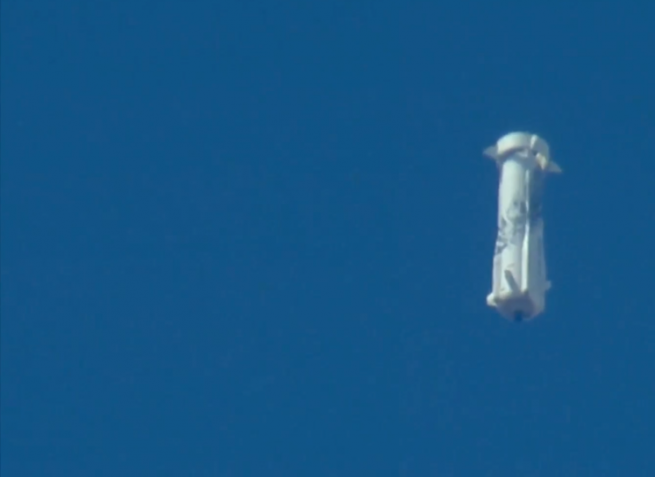 Jeff Bezos later tweeted that the official altitude for the flight was 351,000 feet (66 miles, 107 kilometers), which was higher than what was reported during Blue Origin’s live webcast of the flight. While no announcement was made regarding when commercial passenger flights could start on New Shepard, Ariane Cornell, the Blue Origin commentator, took some time to explain the process of what is planned in terms of a typical customer launch experience. The New Shepard vehicle is serviced and readied for flight primarily in Blue Origin’s Vertical Processing Facility, a place employees call “the Barn.” Cornell pointed out that the New Shepard vehicle’s turnaround time “from Barn to Barn” is only 14 hours. That includes rollout, fueling, checkout, launch, and recovery for the booster and the capsule. An additional point Cornell noted was that Blue Origin manages to execute all this work with a crew of only 30 people. “With that efficiency comes lower cost,” which Blue Origin considers one of the key factors to improving access to space. She explained that customers should arrive in West Texas on a Friday, where they would meet their fellow crew members and trainer. Saturday is dedicated to training, including the overall mission profile, spacecraft ingress and egress, emergency procedures, and zero-g etiquette. Sunday is flight day. Passengers should experience up to 3 gravities at liftoff and 4 minutes of time weightless where they would float around and have the opportunity to look out the capsule’s six wide windows. Cornell provided additional information regarding New Glenn, Blue Origin’s orbital-class launch vehicle. She said that the first flight of that rocket is scheduled before the end of 2020, and that New Shepard customers will get “first dibs” on tickets for New Glenn flights. The first stage of New Glenn is planned to use the same design elements as New Shepard, so the New Shepard tests, while not on the same scale, continue to help prove out hardware and operations for New Glenn. The orbital rocket’s first stage is designed to employ seven BE-4 engines, each generating an estimated 550,000 pounds (2,446 kilonewtons) of thrust, for a total of 3.85 million pounds (17,125 kN). And while the vehicle’s first stage is being developed to land at sea like one of SpaceX’s Falcon 9 or Falcon Heavy first stages, the landing/recovery spot is a ship rather than a barge. 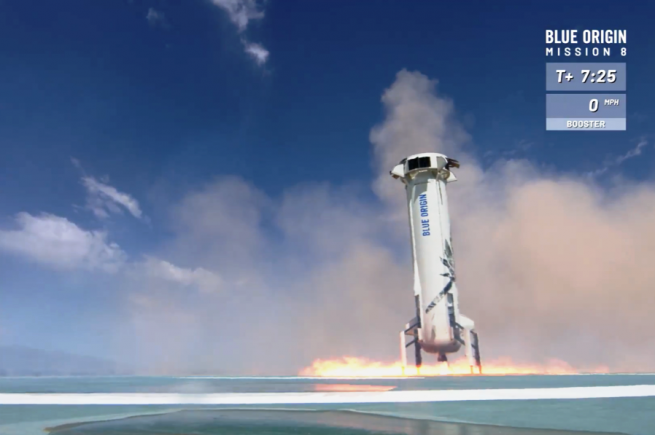 Blue Origin feels that this makes for a more stable landing platform. What happens after this flight is not entirely clear. The public often learns about upcoming Blue Origin flights when founder and CEO Jeff Bezos announces them on Twitter. 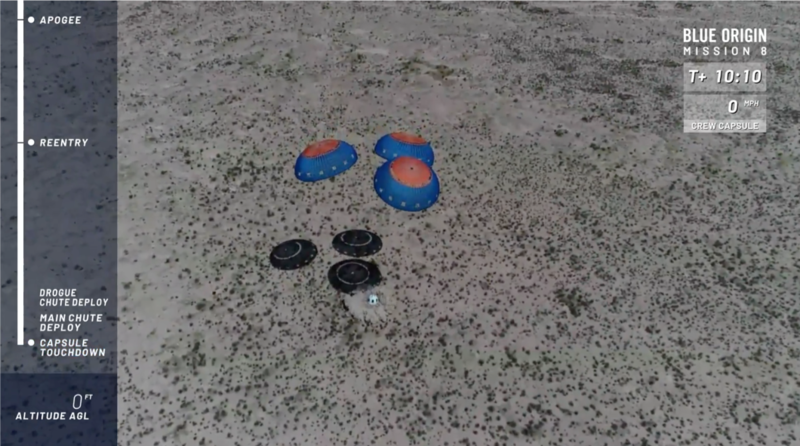 For now, New Shepard will get a new turtle painted on its side in recognition of its successful flight, and the customers who placed payloads onboard will get them back. Some have already accomplished their mission: the payload of one customer, SolStar,sent a tweet from microgravity as a proof of concept for a space-based business. Blue Origin’s effort to get to space “step by step, fiercely” continues. This landing didn’t seem like the previous. The capsule’s retro thrusters did not look like they fired at all. The amount of dust kicked up was what would be expected from a ~20 MPH impact without retro. Thank you for spotting the time zone error. It has now been corrected. Go back and look at the other tests, they all look like that.